Accessories - Re-Steel Supply Company, Inc.
Re-Steel stocks and supplies a variety of bar supports that can be made of steel wire, plastic, or precast concrete. The Slab Bolster, Slab Bolster Upper, Continuous High Chair, and Continuous High Chair Upper are some of the most common bar supports that Re-Steel supplies. We also have many other bar support models available. Please contact us for more information. We also stock and supply couplers, which are devices used to join reinforcing bars and provide a transfer of either axial compression, axial tension, or both from one bar to the other. We have couplers from #3 to #18, which can be ordered in stainless steel or epoxy coated (if required). We do threading for couplers in house and can supply your bars with couplers installed on one end. We also supply couplers that do not require threading. 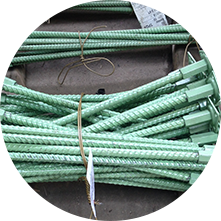 Re-Steel offers a variety of support bars in steel wire, plastic, or precast concrete.